The first of a group of 250 officers and soldiers of The Salvation Army to be posted to France, to serve with General John Pershing's American Expeditionary Force, sailed from New York on August 12, 1917. General Pershing was far from convinced that The Salvation Army's presence at the front line would benefit his troops, and at first the Salvationists were treated with total indifference. At Demange, in the American First Division sector, Salvationists toiled in pouring rain to build a hut, 25 feet wide by 100 feet for the troops' benefit. No one gave them the time of the day, much less a hand. What swung the troops to the Army's side was their sheer practical example; no task was too menial, none too dangerous or difficult. But the Salvation Army won pride of place in American hearts by a brainwave, born of sheer necessity. At Montiers, after thirty-six days of rain, supplies were almost exhausted. Only flour, lard and sugar were left. Ensign Margaret Sheldon, from Chicago's slums, made a suggestion which was to go down in history: "Why don't we make them doughnuts?" They had no rolling-pins or cake-cutters, and gales had blown down their tent, but Salvationists thrive on challenges. Along with Ensign Helen Purviance, Margaret Sheldon crouched in the rain to prepare the dough. An empty bottle did duty as a rolling-pin, and in place of a cutter they used a knife to twist the doughnuts into shape. The first doughnuts, cooked over a wood fire, were a triumph of improvisation. On the first day they served up some 150 doughnuts. The following day's batch topped 300, the traditional hole now being punched out with the inner tube of a coffee percolator. 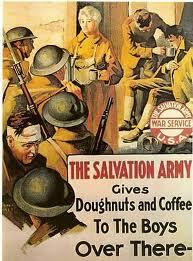 The doughnuts made by the Salvation Army lassies were an instant success with the troops, some queuing for hours in appalling conditions for their daily supply. Soon the troops came to realise that even in the firing line the Salvationists would not neglect them. When lassies like Ensign Florence Turkington crawled under shell fire to deliver coffee and doughnuts to troops in the trenches, letters praising the work of the S.A. began flooding back home. Overnight, the bewildered lassies found themselves to be national heroines. Although often in great danger, Salvationists displayed tremendous courage. At Neuilly in the Argonne, a lassie, lamed by a shell splinter, feared that a visit to hospital might result in all front-line work being vetoed. She limped bravely on, complaining of corns. At Baccarat, the lassies worked so close to the German lines that they couldn't even whisper for fear of being heard by the listening posts. The sermon which came with the coffee and doughnuts was a friendly squeeze on the shoulder. The doughnut became a symbol of The Salvation Army in the U.S. Outside many of the Army rest rooms and hostels were hung giant "doughnuts", eighteen inches in diameter. The Army, by selfless example, had won the hearts of a nation. At the end of the war the American people subscribed an unprecedented $13 million, to meet the debts incurred by The Salvation Army in its war work.